Using a written Tenancy Agreement is key to managing rental properties. At the same time, the lease is a crucial tool in tenant screening. An applicant’s reaction when presented with a lease agreement can signal potential problems. For instance, the tenant who is willing to sign the lease without reviewing it is unlikely to know or follow the rules. Likewise, an applicant who doesn’t ask any questions about the lease probably has no interest in his or her responsibilities under it. 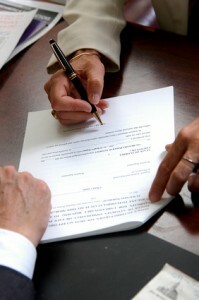 Consider all of the provisions that are controlled by the Tenancy Agreement, like paying rent on time, caring for the property, and respecting other tenants’ rights, and it’s easy to see why it’s important that a rental applicant understand the agreement, and be willing to adhere to those provisions. The lease is more than an enforcement tool. In fact, it’s better for the landlord if it never comes to that. Instead, the real value of the Tenancy Agreement is garnering a tenant’s cooperation. Listening to any objections and discussing any concerns that the applicant has with the tenancy. These steps may take a bit more time than, say, emailing the documents and waiting for a signature. But by following this procedure, a landlord reduces the risk of income loss and sets the stage for a smoother tenancy. A tenant who takes the time to review these documents is more likely to be compliant, and it’s always good to know if the applicant is a bad fit before the individual signs the lease or takes possession of the rental property. Never allow the applicant to move into the property before the Tenancy Agreement and Notice to Tenant are signed. Professionalism is important in minimizing income loss. The Tenancy Agreement should be clean and easy to follow. Before providing a copy to the rental applicant, make sure all pages are numbered, and that exhibits, addenda and other attachments are included. Generally, those add-ons should be referred to in the body of the lease agreement, and there should be no other documents referenced as part of the lease that are not attached. Problems can occur when modifying a lease agreement used in another province or for a different type of property. Read the entire lease document from beginning to end and watch for inconsistencies. Don’t ask the tenant to sign a Tenancy Agreement that doesn’t make sense or that they don’t understand. The tenant needs to take the lease agreement seriously — every word of it. Create a summary of central lease terms, and recite that to rental applicants during the prequalification process. The sooner an unqualified applicant drops off the better. The more energy and time the person puts into the leasing process, the more likely he or she will complain if rejected.